Born in Gettysburg, she was the daughter of the late Charles and Beulah Sager Evans. She was retired from Olivetti Ribbon Supply after 30 years of service; and she was a member of Valley Baptist Church, Middletown, where she taught Sunday school and sang in the choir. She was preceded in death by a daughter Donna Culbertson, a son Anthony Fratangeli, and a granddaughter Mary Jane Culbertson. She is survived by six children Shirley Yoder (Rodney) of Port Royal, Vicki Grunden (Edward) of Highspire, Kenneth Manahan (Debbie) of Elizabethtown, Terry Manahan (Ruby) of North Carolina, Craig Manahan (Katie) of North Carolina, and William J. Fratangeli (Dolleen) of Mechanicsburg; daughter-in-law Jacqueline Fratangeli of Harrisburg; 14 grandchildren; 16 great-grandchildren; and one great-great-grandchild. Carrie’s Life Celebration service was held on Friday at her church, with the Rev. Jerry Cowan officiating. Interment was in Blue Ridge Memorial Gardens. 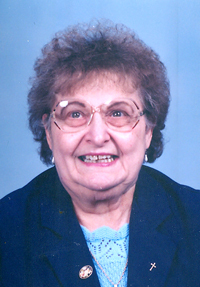 In lieu of flowers, memorial contributions may be made to her church at 1190 N. Union St., Middletown, PA 17057. Arrangements by Coble-Reber Funeral Home, Middletown. To share your fondest memories of Carrie, please visit www.lifecelebration.com.